CEBU CITY – Almost a year after Cebu hosted the first Philippine Shark Summit, the province strengthened its commitment to protect shark and ray species by establishing the country’s first shark and ray sanctuary, located close to Malapascua Island, in the Municipality of Daanbantayan. Through Executive Order 16-2015 Engineer Augusto Corro, the Municipal Mayor of Daanbantayan, has designated the world-renowned dive sites of Monad Shoal and Gato Island as a shark and ray sanctuary, prohibiting the catching and trading of all shark and ray species within these waters. Rare species, such as thresher sharks, whitetip sharks, manta rays, and devil rays, can be found in these areas. The new EO was welcomed by environmentalists, marine conservationists, tourism executives, and local government agencies that gathered at the Cebu Provincial Capitol for a three-day forum on strengthening and implementing the province’s shark and ray ordinance. Studies conducted by the Thresher Shark Research and Conservation Project estimates that approximately 80% of the municipal economy of Daanbantayan is fueled by scuba diving, providing employment and supporting livelihoods of local communities and its neighboring municipalities. QUEZON CITY – Forty-seven year old hairdresser and HIV positive Rene Nocos came out in public today after accusing former employer Ricky Reyes of alleged discrimination, unlawful termination and for non-payment of his social protection benefits Social Security System (SSS) and PhilHealth premiums. “I have committed wrong choices in the past and suffered heavily for it. My entire family have disowned me. My friends have abandoned me. My co-workers have condemned me. Despite all these, I need my life back. But I can’t rebuild my life back because I was laid off from my job just because I have HIV. I want to put the pieces back together but my employer, Ricky Reyes, denied me of my social protection through SSS and in PhilHealth,” Nocos said. Nocos said he had filed on March 3, 2014 multiple labor violations against respondent Reyes as owner of Ricky Superstyle Color Salon and Ms. Tonette Moreno, the vice president, as co-respondent before the National Labor Relations Commission (NLRC) after he was fired on February 28, 2014. Reyes and Moreno were charged with illegal dismissal, underpayment of wages and mandatory 13th month pay, non-payment of holiday pay, non-payment of separation pay and discrimination. Nocos, also known as “Bambi”, also filed a complaint against his two former superior at the SSS and Philhealth non-payment of premiums since he was employed on July 16, 2003. “We are appealing to the NLRC, SSS and Philhealth to render as quickly as possible their judgment on the case filed by Rene. The justice rendered by these institutions is very important factor in Rene’s struggle to move his life on. There is no closure and there is no new beginning for him if there is injustice. We ardently appeal to these agencies to expedite the cases Rene has filed and help him in moving away from discrimination and charting a new life,” said Gerard Seno, executive vice president of the Associated Labor Unions (ALU) during the press conference. Nocos said he was fired by Reyes on February last year after confronting the latter for non-payment of Philhealth premium contributions. “I tried to avail of free outpatient HIV/AIDS Treatment or OHAT package using Philhealth but I discovered only last year that my employer is not making any payment at all. So I confronted him (Reyes) why he is not paying my Philhealth. He (Reyes) then fired me after learning that I have HIV right there and then,” Nocos said. On his part, ALU policy advocacy officer Alan Tanjusay said they will request the Department of Labor and Employment (DOLE) Secretary Rosalinda Baldoz for the Labor Law Compliance Officers (LLCO) to conduct inspection and assessment of all salon outlets owned by Reyes and Moreno. “We want the DOLE to conduct complaint assessment of all Reyes’ salons in the country and make sure that all its workers are being paid with the mandated wages and benefits and check if they are paying the SSS and Philhealth of all Ricky Superstyle Color Salon workers,” Tanjusay said. TACLOBAN CITY – The National Maritime Polytechnic (NMP), a government maritime training and research agency located at Brgy. 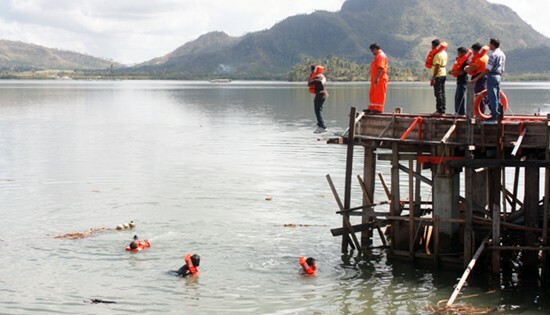 Cabalawan, this City, continues to offer the three-day Basic Safety Training (BST) intended to motorboat operators, handlers and fishermen and the one-day Basic Safety Training (BST) for boat captains and marine diesel mechanics. These courses are regularly offered at the NMP Training Complex every semester. BST for boat captains and marine diesel mechanics costs P300.00 only while BST for motorboat operators, handlers and fishermen could be covered by a Memorandum of Agreement (MOA) between NMP and the concerned local government unit (LGU) and/or non-government organization (NGO). Existing MOA with the LGU and/or NGO stipulates that it is their duty and responsibility to identify and invite participants to the training in coordination with NMP. They should also provide the financial and administrative support such as provision of snacks and meals of participants and shoulders 50% of the cost of dormitory fees if billeted in NMP. Further, they also submit the necessary qualifying documents of the participants such as medical certificates. NMP, as the training provider, designs the training course tailored to the training needs of the participants in consultation with relevant external entities. It also provides the venue for training and support staff to assist in the duration of the activity; and funding for supplies, training materials for hand-outs of participants. This course may include topics on Personal Survival Techniques (PST), Rules of the Road, Fire Prevention and Fire Fighting (FPFF), Elementary First Aid (EFA), Marine Pollution Prevention and Environmental Protection, STD/HIV/AIDS Prevention in the Maritime Sector (SHAPIMS), Prevention of Alcohol and Drug Abuse in the Maritime Sector (PADAMS), Marine Safety Regulations and Typhoon Preparedness. However, as previously mentioned, the modules/topics in this training vary depending on the knowledge, skill and attitude (KSA) needed by the participants. In December 2014, NMP conducted this training to 19 fishermen beneficiaries of Burublig Para Ha Tanauan (BPHT), a non-profit non-governmental organization with charitable, service, participatory and empowering orientation, funded by private individuals, in aid to the communities of Tanauan, Leyte after the onslaught of the super-typhoon Yolanda. In the interim, NMP is establishing linkage with the Food and Agriculture Organization of the United Nations (FAO) for a possible Memorandum of Agreement (MOA) in the conduct of this training to at most 1,000 fishermen in Eastern Visayas who were victims of the devastation of super-typhoon Yolanda in 2013. Meanwhile, NMP is now offering three MARINA-accredited STCW courses, namely, Operational Use of Electronic Chart Display and Information System (OUECDIS), Ship Security Awareness Training and Seafarers with Designated Security Duties (SSAT and SDSD), and Consolidated Marine Pollution (MARPOL) 73/78 Annexes I-VI. It also continues to offer its Faculty Development Courses (IMO Model Course 6.09 Training Course for Instructors; IMO Model Course 6.10 Training Course for Simulator Instructors and Assessors; and IMO Model Course 3.12 Assessment, Examination and Certification of Seafarers), and other upgrading courses for marine officers and ratings such as Marine Electrical System (MES), Marine Refrigeration and Air Conditioning (MRAC), Maritime Law for Ship’s Officers (MAR LAW), STD/HIV/AIDS Prevention in the Maritime Sector (SHAPIMS), and Gender Sensitivity Training for Seafarers (GSTS). The training schedule for these courses is now available at NMP. For more inquiries and reservation, you may reach the Registrar at the following contact numbers: 09771269675/09298417490. You may also e-mail us at info@nmp.gov.ph or nmp.info@yahoo.com. Or, visit our Training Complex in Brgy. Cabalawan, Tacloban City. CAMP VICENTE LUKBAN, Catbalogan City – Three NPA members operating in the First District of Northern Samar surrendered to the 63rd Infantry (Innovator) Battalion’s “A” Company stationed at Barangay Polangi, Catarman, Northern Samar at 8:A.M. of June 27, 2015. The three NPAs were Gladys Surio aka Ara, Juvy Gonzaga Somodoy aka Obet and Alberto Cuanico Somodoy aka Tatang/Leon were on lie-low when they voluntarily surrendered. Based on the 8ID record, they were under the Front Committee 2, Northern Samar Provincial Party Committee, now known as Sub-Region Committee Emporium. According to Lt. Col. Carmelito L. Pangatungan, Commanding Officer of 63IB, the three NPAs were accompanied by five Kagawad members of Barangay Gebulwangan, Catarman Northern Samar when they surrendered. They are currently under the custody of 63IB while their surrender papers are on process. Major General Jet B. Velarmino, 8ID Commander, lauded the efforts made by the 63IB that resulted to the surrender of the three NPA members and also encouraged them to double their effort in winning the peace through community service. He also renewed his call for NPA members to return to the mainstream of society and avail of the government programs intended for NPA rebels and enjoy life with their respective families, not a life of an NPA that is full of uncertainty, or a life that is always on the run. He stressed that the 8ID will ensure the safety and well-being of NPA surrenderees while they are in military custody. MAKATI CITY – Due to the poor source of information on academic opportunities in the Philippines, Filipino-French Henry Motte-Muñoz established an online portal called Edukasyon.ph where incoming college students can find courses, schools, and scholarships on one site for free. “Limited career orientation, expensive tuition fees, and lack of knowledge on where to search for educational opportunities are some of the key problems that high school students and individuals seeking to expand their education and professional development are encountering in choosing the right course and university. Students need help in finding the educational opportunity that will fit their interests, budget, and desired location,” said Edukasyon.ph Chief Executive Officer Ms. Linartes Viloria. According to the National Statistical Coordination Board (NSCB), there are a total of 7.2 million high school students and only 3.6 million of them are pursuing college, as of 2014. “We want to make it easier for students to find the different educational options available for them in the Philippines. Through our online portal, students can now explore all the college and technical-vocational courses offered in our country,” Viloria added. Currently on beta, the website boasts of more than 3,000 schools, 30,000 courses, and 2,000 scholarships which are offered all over the Philippines. “There are so many opportunities for education out there that a lot of our students are unaware of. And these include scholarships they can avail of in the different universities. We want to share this information to help more students get the education that they deserve,” stressed Viloria. Students can easily find schools and scholarships that match their interests and needs just by logging on at www.edukasyon.ph and registering to get a listing of Philippine universities and courses, as well as scholarship updates. “We are thrilled to share with students of Eastern Visayas educational possibilities offered across the country. By giving students a complete picture of what is available for them, we believe that we are able to help them find the education that can get the jobs that they dream of. We want to give them opportunities, empower them with choices, and help them achieve success for the careers they aspire for,” said Viloria. CAMP LUKBAN, Catbalogan City – Army troops under the Burauen based 78th Infantry Battalion, personnel from Philippine Navy, PNP and DENR confiscated 1,586 Board Feet of illegally cut lumbers at Barangay Villa Corazon, Burauen, Leyte on June 24, 2015. In a report from Lt. Col. Allan Jose L. Taguba, Commanding Officer of the 78th Infantry Battalion, Kenneth Yves Salon, Chief Surveillance and Intel Section Division of DENR Regional Office 8 made coordination with 78th IB to assist them in confiscating illegally cut lumbers. The Anti-Illegal Logging Task Force created under Executive Order 23 which is chaired by the Environment Secretary, with the Interior Secretary, Defense Secretary, the Armed Forces Chief, and the Philippine National Police Chief as members, approved a resolution deputizing all officials and personnel of the Armed Forces of the Philippines as environment and natural resources officers. Meanwhile, the 8th Infantry Division and its subordinate units spread throughout Region 8 and Bohol has planted 6,380 assorted non-fruit and fruit bearing trees from January 2015 to June 2015 in its thrust in protecting the environment. Maj. Gen. Jet B. Velarmino, 8ID Commander, lauded the joint anti-illegal logging operation of Army, Navy and PNP for exercising its mandate as protector of environment and natural resources by assisting the DENR in enforcing environmental laws. Further, he reiterated the 8ID under his command will continue support to the DENR in implementing its environmental protection programs. PASAY CITY – Senator Chiz Escudero said the Department of Education (DepEd) failed to construct a single school building to date despite an allocation of more than P40 billion for its construction program under the 2015 national budget. “We allocated over P40 billion for the school building program for 2015 pero ni isa, June na, wala pang nagagawang school building under the 2015 budget,” Escudero told a news forum in Manila on Wednesday. The senator cited the DepEd as among the government agencies that lacked absorptive capacity to spend, thus contributing to public underspending which was largely blamed for the disappointing economic growth in the first quarter. At the same time, Escudero expressed his strong opposition to the public-private partnership (PPP) project being undertaken by the DepEd for the construction of new classrooms, saying it was more costly for the government. “I’m against the PPP for classrooms kasi may pondo naman tayo e. Bakit mo gagamitin pa sa PPP ‘yung classrooms?” he pointed out. Escudero said he did not see the need to contract out the building of classrooms under a project which the government could have easily implemented itself. He added that the government was at the losing end of a deal that gave contractors a return rate of 10 percent, considering that it could borrow three to four percent from others. “The mode of PPP for classroom is actually a more expensive way of borrowing to construct classrooms, when in fact we have sufficient funds to construct our own classrooms,” Escudero stressed. Escudero said that engaging in PPP would not address the risk of corruption in infrastructure projects. “Kung korapsyon pala ang problema e ‘yun dapat ang i-address mo. Huwag kang uutang ng mas mataas,” Escudero said. TACLOBAN CITY – Tacloban City government and Leyte Provincial Council have signed recently resolutions of support pushing for the passage of House bill 5285 or the Children’s Emergency Relief and Protection Act, a groundbreaking bill that seeks to provide enhanced relief and protection for vulnerable children caught in disasters. As was one of the worst-hit areas by Typhoon Yolanda and ‘center’ of disaster in November 2013, the province of Leyte and its capital Tacloban city are critical areas of support for the bill. The bill proposes that DSWD and other national agencies develop a comprehensive plan to enhance services, increase protection and services for children before, during and after disasters. Some of the noteworthy provisions include: improved family tracing for unaccompanied minors, disaggregated data collection to identify children, trainings on child-focused response, restoration of civil documents and setting up a mechanism to limit use of schools are not used as evacuation over an extended period of time. 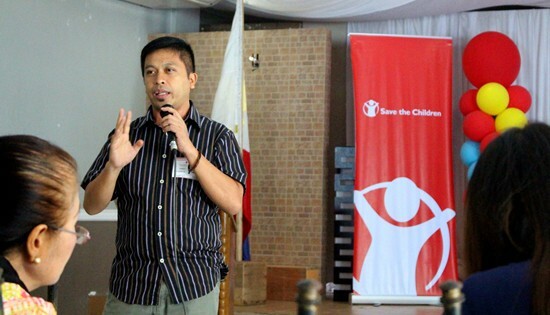 Today, the Save the Children holds a policy forum to discuss the bill with over 100 representatives from LGUs, non-government organizations, community leaders and children in Tacloban. In a short ceremony during the forum, Save the Children awarded plaques of appreciation to the province of Leyte, Tacloban City and over 10 municipalities across Leyte for passing resolutions of support addressed to the Senate and House of Representatives. PASAY CITY – Senator Chiz Escudero said discussions on the spending package for the implementation of the proposed Bangsamoro Basic Law (BBL) will be put on hold until the measure is passed into law. “Hangga’t wala pang BBL na naipapasa, hindi ito pwede aksyunan,” Escudero said, referring to the funding support that the national government plans to extend to the proposed Bangsamoro region. Escudero, chairman of the Senate Committee on Finance, earlier disclosed that the planned Bangsamoro government stands to receive at least P70 billion in the first year of the BBL’s implementation. He said the amount was just a ballpark figure and was on top of the revenue income the Bangsamoro government could generate should it begin imposing taxes and fees, and exploring natural resources. The senator previously vowed to push for the line-item budgeting of the BBL funds to ensure transparency and accountability into the spending of government funds. Based on the computation of the finance committee in the past, P25.2 billion of the P70 billion will come from the Annual Block Grant; P7 billion from the Special Development Fund; P1 billion from the Transition Fund; P12.6 billion from the National Government Subsidy; P19.9 billion from the Internal Revenue Allotment (IRA); P1.7 billion from the ARMM/Bangsamoro collections; and a one-time P2.6 billion Normalization Fund. (From L-R) LtCol Antonio Dulnuan Jr., MajGen Jet Velarmino and LtCol George Domingo during the Change of Command of 87th Infantry Battalion at Brgy. Polangi, Calbiga, Samar on June 23, 2015. 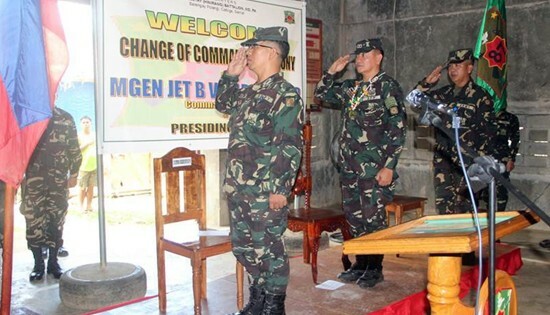 CAMP VICENTE LUKBAN, Catbalogan City – Major General Jet B. Velarmino AFP, Commander 8th Infantry (Stormtroopers) Division, Philippine Army presided the Change-of-Command of 87th Infantry (Hinirang) Battalion in a ceremony conducted at Headquarters 87IB at Brgy Polangi, Calbiga, Samar last June 23, 2015. Lt. Col. Domingo succeeded Lt. Col. Antonio B. Dulnuan Jr. and took over the helm of 87IB that covers Calbiga, Jiabong, Basey Marabut, Motiong, Paranas, San Jose de Buan, Pinabacdao, Hinabangan, Sta Rita, Talalora, Villareal, Daram, Zumarraga and Catbalogan all of Samar Province. Dulnuan will assume a position at Headquarters 8ID. Prior to taking the helm of 87th Infantry Battalion, Domingo was the Brigade Executive Officer of 801st Infantry Brigade of the 8th Infantry Division, Philippine Army based at Brgy Fatima, Hinabangan, Samar. Velarmino in his message acknowledged the contribution of Dulnuan to the peace and development that the province of Samar is now experiencing, at the same time, he challenged Domingo to continue the plans and programs initiated by his predecessor for the overall accomplishment of the Commands mission and the realization of an Insurgency Free Samar. PASAY CITY – Senator Chiz Escudero welcomed plans by the government to restart negotiations with the Communist Party of the Philippines (CPP), and expressed hopes that the two parties make concrete progress to resume the stalled peace talks as soon as possible. “We should welcome this positive development. Any effort that would bring armed conflict to a permanent and just closure through peaceful means deserves the nation’s support,” Escudero said. He said it was also important that before returning to the negotiating table, each side put forward concrete proposals rather than just complaints and accusations. “I encourage both sides to persevere in their commitment to a peaceful and just settlement of conflicts, otherwise the peace talks will again lead to nothing,” Escudero said. Talks with the CPP and its armed wing, the New People’s Army (NPA), were suspended a few years ago after the communist rebels demanded the release of their consultants from government custody. The CPP-NPA reportedly prefers to talk peace with the next administration after questioning the Aquino government’s sincerity in the peace talks. But just recently, government negotiators said they were coordinating with Norway to determine how the negotiations with the communist group can move forward. Norway facilitates the peace talks between the government and the National Democratic Front, the CPP-NPA’s negotiating arm.